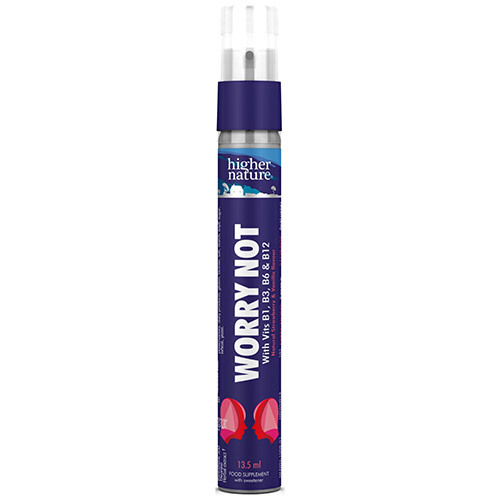 The Worry Not natural strawberry & vanilla flavour spray can assist in those moments in life when you feel anxious or overwhelmed. A supportive blend of amino acids, B vitamins and herbs. With Vitamins B1, B3, B6 and B12 which contribute to the normal functioning of the nervous system and normal psychological function. Contains lemon balm and passionflower which are known to help aid relaxation. Also contains lavender and magnolia bark. † Lavender, Lemon Balm, Passionflower, Magnolia Bark. Purified water, sweetener: xylitol, glycerine, proprietary herbal extract, emulsifier: acacia gum, niacin (as nicotinamide), natural vanilla & strawberry flavour, d-panthenol, l-theanine, pyridoxine HCl, thiamine mononitrate, preservative: potassium sorbate, folic acid, vitamin B12 (methylcobalamin), alcohol. 8 sprays in mouth as and when required. Below are reviews of Worry Not - Strawberry & Vanilla - Oral Spray - 13.5ml by bodykind customers. If you have tried this product we'd love to hear what you think so please leave a review. Great taste and have found this to be affective as prescribed medication for stress and anxiety.